While living cells are far more than just machines, just as the human brain is far more than just a computer, there is value in looking at the mechanical aspects of the cell and its external environment and to also recognize the existence of machinery within the cell, which has evolved for mitosis, cytokinesis, phagocytosis, autophagy, whole cell locomotion or many of the other myriad tasks performed by cells that require that they transduce force, transmit force or respond to force. The study of cell and tissue mechanics involves at least three major components: extracellular matrix, cell adhesion machinery (both cell-cell and cell-ECM) and the cytoskeleton. 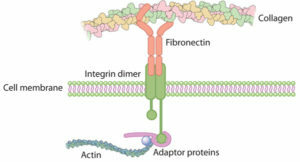 It is the cell adhesion machinery (involving a variety of structures [such as adherens junctions, desmosomes and tight junctions] and molecules [integrins and cadherins] associated with the cell surface that mechanically links the cytoskeleton inside the cell to the extracellular matrix outside the cell) that allows the cell to exert force on its environment (both extracellular matrix and neighboring cells) and for the environment to exert forces on cells. Mechanical inputs to a cell can regulate the most fundamental of cellular processes, including whole cell locomotion, cell division, gene transcription and differentiation. Conversely the cytoskeleton located within the cytosol of the cell (through both assembly and disassembly dynamics as well as a myriad of motor protein complexes) can exert force on its environment to reshape the extracellular matrix or even the entire embryo during development (through processes such as convergence-extension) and can bring about whole cell locomotion through connective tissues. At the more macro level, many parts of the body respond to forces from the environment, be it frictional shear on the epidermis of the skin or pressure on the bones which can regulate cell division and turnover as well as morphogenesis. Flows through epithelial cells such as blood vessels and kidney tubules are sensed by the cells (and their primary cilia) and result in the activation of signaling pathways regulating processes like smooth muscle contraction and glomerular filtration. Faculty laboratories in the Department of Cell Biology are studying many aspects of force associated with cells and tissues and the three associated areas of cell biology, the cytoskeleton, the cell adhesion machinery and the extracellular matrix, as they relate to both morphogenesis of the organism and the functioning of the adult.